BuildForce UK is an industry-led initiative to encourage military service leavers and veterans into careers in the UK construction sector. About 14,000 people leave the Armed Forces annually and the vast majority do not come into the construction industry, which means we miss out on a lot of talent that can help us close the reported skills gap. 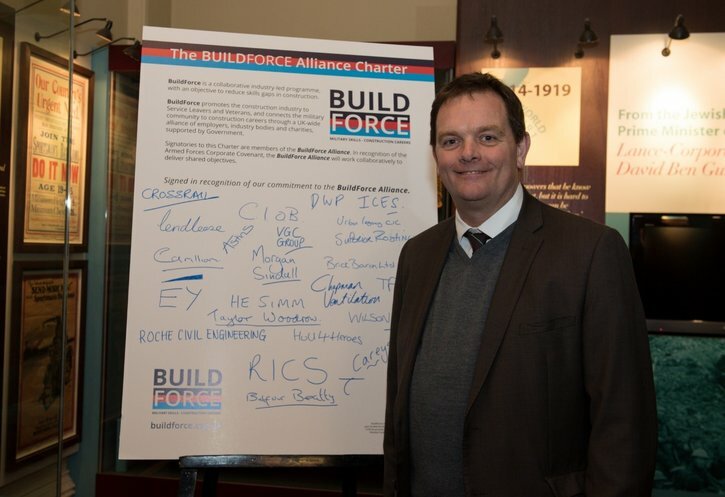 Julian Gatward, our Managing Director, is pictured signing Taylor Woodrow up as a member of BuildForce UK so that we can work with the Armed Forces Community and encourage more of these people to come into our business and industry. The aim of BuildForce UK is to become a ‘one stop shop’ that connects Service Leavers and Veterans to construction careers and so our team members will become mentors to a Service Leaver or Veteran and provide advice to them about the industry and the various pathways into it.